Introduction: The humanistic burden of schizophrenia is levied mostly upon the families in India which act as the primary source of caregiving. Studies have found that symptomatic patients with schizophrenia suffer from significant disability compared to those patients with minimal symptoms. Studies have reported positive correlation between patient's disability and higher number of needs perceived by caregivers of schizophrenia. There has been no evaluation of this aspect in first-episode schizophrenia (FES). Objective: The objective of this study was to evaluate the disability in patients with FES and find the relationship with the caregivers' perception of their needs. Methodology: This cross-sectional study included symptomatic patients with FES (Group 1; n = 30) along with their caregivers and patients with FES having minimal or no symptoms (Group 2; n = 30) along with their caregivers. The assessment was done using the World Health Organization Disability Assessment Schedule 2.0 for patients and Camberwell Assessment of Need-Short Appraisal Schedule for caregivers. The correlation was done among the level of disability in patients, patients' needs as perceived by their caregivers, sociodemographic, and clinical variables. Multiple regression analysis was done with needs as the dependent variable and other variables as independent predictors. Results: Among the patients with FES, Group 1 had higher disability scores than the Group 2 (t = 23.22, P < 0.01). Total needs of the patients as perceived by their caregivers were similar in both the groups. The unmet needs were more for Group 1 as compared to Group 2 (t = 16.45, P < 0.01). The former had more met needs compared to the latter (t = −13.23, P < 0.01). Disability in patients was positively correlated to illness duration (r = 0.65), unmet needs (r = 0.96), and total needs (r = 0.71). Sociodemographic parameters are not related to illness-related disability or caregivers' perception of the needs. Patients' disability, alogia, and asociality were the significant positive predictors of the unmet needs as perceived by caregivers in Group 1. Conclusion: Symptomatic patients with FES have more disability and more unmet patients' needs as perceived by their caregivers as compared to FES with minimal or no symptoms. Schizophrenia is a significantly disabling disease that affects all areas of life. Most of the patients have their onset of illness between the ages of 15 and 17 years. Early intervention in patients with first-episode schizophrenia (FES) leads to better chances of recovery in comparison to persons with chronic illness. Studies have found that symptomatic patients with schizophrenia suffer from significant disability compared to those patients with minimal symptoms. Total duration of hospitalization and positive and negative symptoms were found to be strongly associated with disability in schizophrenia. In addition to the standard pharmacological treatments, patients with schizophrenia benefit from various psychosocial interventions, adherence to medications, vocational rehabilitation, and emotional support. Caregivers play a major role in providing most such interventions, especially in low-resource settings such as India, where still there is a huge treatment gap of 75% for psychotic disorders. Caregivers are invaluable assets in bridging the treatment gap as they monitor the patients, take care of day-to-day needs, identify early signs of illness, supervise treatment, and help the patients in accessing the health-care services. Identifying the needs of the patient perceived by the caregivers could help in understanding the expectations of caregivers and also useful in developing adequate interventions. The needs perceived by the caregivers of FES are different compared to caregivers of patients with chronic illness. Caregivers of FES have a relative suffering from schizophrenia for the first time, hence their understanding of the illness and requirements of their patients differ from caregivers of patients with long duration of illness. While literature on the economic impact of schizophrenia is abundant, few studies have focused on its humanistic burden, which not only concerns patients but also relatives and caregivers. It is estimated that 4.8% of caregivers of persons with schizophrenia had terminated employment and 15.5% took a mean of 12.5 days off work per year as a result of their caregiving role. There have been several studies on the need assessment of caregivers of patients with psychoses or schizophrenia though not specifically on caregivers of patients with FES., The objective of the current study is to evaluate the disability in patients with FES and find the relationship with the caregivers' perception of their needs. Such study is needed, especially in developing countries such as India, where the caregivers play an important role in decision-making regarding the healthcare needs of the patient. This cross-sectional study recruited participants among those attending the outpatient clinic and admitted in ward in the Department of Psychiatry at tertiary care hospital and medical school in North India. Patients with FES and their primary caregivers were recruited as two groups. The first group consisted of 30 symptomatic patients with FES and their caregivers. Thirty patients with FES with minimal or no symptoms and their caregivers were recruited in the second group. Patients with FES between the age group of 18–45 years, either gender, with Diagnostic and Statistical Manual of Mental Disorders (DSM-5) diagnosed schizophrenia, and duration of illness ≤2 years were included in the study. All the study participants had received at least one course of standard dose of antipsychotics. Informed consent was obtained from all the participants before recruitment into the study. Patients with any other psychiatric disorder, history of intellectual disability, and history of chronic physical disease were excluded from the study. Patients with a score of ≥3 in the Scale for the Assessment of Positive Symptoms (SAPS) on items 7 or 20 or 25 or 34 were recruited in the first group of symptomatic FES. Patients with a score of ≤2 in SAPS on each of the items 7, 20, 25, and 34 were recruited in the second group of FES with minimal/no symptoms. Consultants and senior residents in the psychiatry outpatient department and C1 ward, AIIMS, were requested to refer all the patients with schizophrenia. The diagnosis was confirmed using DSM-5 criteria by a clinical interview. Participants were screened for psychiatric comorbidity using MINI 7.0 screen, and for physical, neurological, and substance use comorbidity and pregnancy by history and clinical examination. Informed consent from the patients and their caregivers was taken for participation in the study. All the patients were assessed with the instruments: semi-structured sociodemographic and clinical data sheet, SAPS, Scale for the Assessment of Negative Symptoms (SANS), World Health Organization Disability Assessment Schedule (WHODAS) 2.0 (interviewer administered), and all the caregivers were assessed with Camberwell Assessment of Need-Short Appraisal Schedule within 1 week of inclusion in the study. Ethical permission was taken before the study from the Institute Ethical Committee (IEC-529/U. U.2016). The analysis was performed using the Statistical Package for the Social Sciences (IBM Corp. Released 2013. IBM SPSS Statistics for Windows, Version 22.0. Armonk, NY: IBM Corp.). Descriptive statistics such as percentages and central tendencies was calculated. Data were assessed for normal distribution using the Shapiro–Wilk test. Inferential statistics in the form of group comparisons was done using Student's t-test for parametric data and Chi-square test for nonparametric variables. Correlation between the levels of patient disability, caregiver needs, sociodemographic, and clinical variables was calculated using Pearson's and Spearman's correlation as appropriate. Multiple regression analysis was conducted with needs as the dependent variable and other variables as independent predictors. P < 0.05 was considered statistically significant. Each of the two groups included 30 participants each. The mean age of the participant was comparable among the two groups (Group 1 – 24.8 ± 3.03 years, Group 2 – 25.26 ± 3.38 years, t = −0.56, P = 0.57). 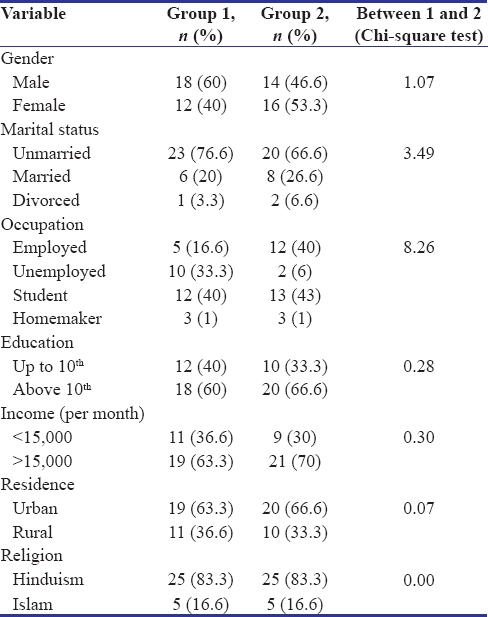 There was no overall difference among the groups for any sociodemographic parameter except for occupation [Table 1]. There were more participants unemployed in Group 1 compared to Groups 2 (χ2 = 8.19, P = 0.004). Participants in Group 1 and 2 were comparable for mean illness duration (t = −0.84, P = 0.40) and age at illness onset (−0.83, P = 0.41). As compared to participants in Group 2, those in Group 1 had higher total mean scores on SAPS (t = 19.47, P < 0.01). On subscales of SAPS, scores were higher on the scales for hallucinations (t = 11.34, P < 0.01), delusions (t = 13.39, P < 0.01), bizarre behavior (t = 5.56, P < 0.01), and positive formal thought disorder (t = 4.67, P < 0.01). As compared to participants in Group 2, those in Group 1 had higher mean scores total mean scores on SANS (t = 6.56, P < 0.01). On the subscales of SANS, scores were higher on the scales for affective flattening (t = 4.96, P < 0.01), avolition-apathy (t = 2.17, P = 0.34), anhedonia-asociality (t = 5.54, P < 0.01), and attention (t = 2.45, P = 0.02) [Table 2]. The mean percentage of disability in symptomatic patients with FES was 67.02% ± 6.72%. In symptomatic patients with FES, the difficulties assessed by WHODAS 2.0 were present for the mean duration of 25.63 ± 2.47 days in the past 1 month. They were totally unable to carry out and cut back the usual activities or work for 12.93 ± 2.22 days and 9.96 ± 1.95 days, respectively, in the past 1 month. The mean percentage of disability in patients with minimal or no symptoms was 33.83% ± 3.98%. In minimal or no symptoms patients with FES, the difficulties assessed by WHODAS 2.0 were present for the mean duration of 11.6 ± 2.68 days in the past 1 month. They were totally unable to carry out and cut back the usual activities or work for 1.46 ± 0.97 days and 5.63 ± 1.33 days, respectively, in the past 1 month. There was an overall difference among the two groups regarding disability as assessed over WHODAS 2.0. It was observed that the participants in Group 1 had more disability than Group 2 (t = 23.22, P < 0.01). There was a significant difference among the caregivers' perception of needs for participants in Groups 1 and 2. The unmet needs were more for Group 1 as compared to Group 2 (t = 16.45, P < 0.01). Whereas, the met needs were more for Group 2 as compared to Group 1 (t = 13.2, P < 0.01). Total needs were similar to both groups [Table 2]. None of the sociodemographic parameters were significantly correlated to disability in patients' or caregivers' perception of needs [Table 3]. Total score on SAPS was positively correlated to scores on individual subscales on SAPS, score on WHODAS (r = 0.93), number of met needs (r = 0.54), number of unmet needs (r = 0.91), and total number of needs (r = 0.64). Total score on SANS was significantly correlated to scores on individual subscales on SANS [Table 4]. Disability in patients was positively correlated to duration of illness (r = 0.82), number of met needs (r = 0.35), number of unmet needs (r = 0.97), and number of total needs (r = 0.83). The duration of illness was also positively correlated to number of met needs (r = 0.78), number of unmet needs (r = 0.71), and number of total needs (r = 0.96). Total met and unmet needs were significantly correlated to each other. Total and unmet needs of caregivers and disability scores in patients were significantly correlated to SAPS and SANS total as well as subscale scores. 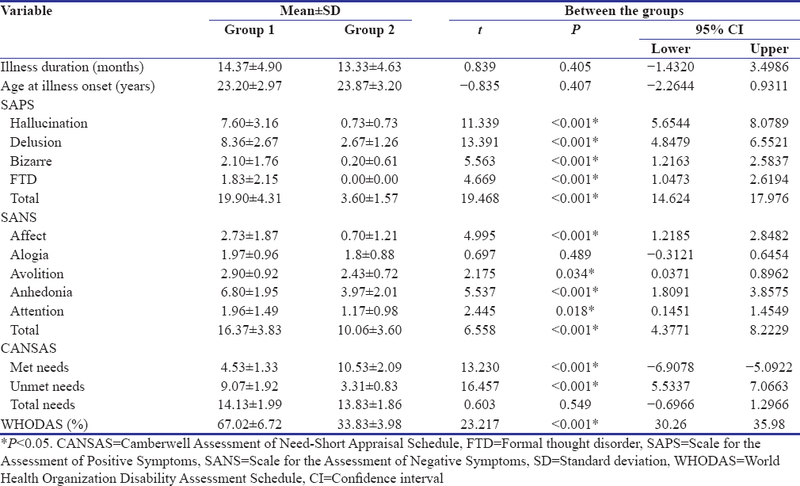 However, scores on formal thought disorder subscale of SAPS were not significantly correlated to WHODAS scores and unmet needs [Table 4]. The linear regression explains 46.6% and 57.3% of the variance in the met needs and 93.1% and 78.9% of the variance in the unmet needs for Groups 1 and 2, respectively [Table 5]. The Durbin–Watson value was between the two critical values of 1.5 < d < 2.5 suggesting the assumption that there was no first-order linear autocorrelation in the multiple linear regression data in both the groups for the met and unmet needs. The linear regression's F-test has null hypothesis that the model explains zero variance in the dependent variable (in other words R2 = 0). The F-test was significant; endorsing the assumption that the model explains a significant amount of the variance for met and unmet needs in Groups 1 and 2. The clinical variables were significant predictor for met needs in Group 1 and unmet needs in Groups 1 and 2 [Table 5]. In symptomatic patients with FES, scores on WHODAS, alogia, and anhedonia-asociality subscales on SANS were significant positive predictors, while scores for affective-flattening and attention subscales on SANS were significant negative predictors for unmet needs. For met needs in symptomatic patients with FES, score on SANS for affective-flattening was significant positive predictor, and that for anhedonia-asociality was significant negative predictor. For unmet needs in none or mildly symptomatic patients, WHODAS score was the significant positive predictor, and score for affective-flattening on SANS was significant negative predictor [Table 6]. To the best of our knowledge, this is the first Indian study to assess the caregiver's perception of needs in patients with FES. The current study found that symptomatic FES patients had more disability as compared to none or mildly symptomatic patients. Disability in patients was strongly correlated with longer duration of illness along with more positive and negative symptoms. Similar to our findings, a 5-year longitudinal Indian study reported that disability correlated positively with psychopathology at 6 and 12 months and time spent in psychotic episodes. Understandably, individuals having symptomatic FES were more unemployed than those with none or minimal symptoms. Indian studies have reported a strong association between disability and unemployment. The relationship between unemployment and disability suggests that these results from the same disease process. We found that unmet needs perceived by caregivers were more in those with symptomatic FES in comparison to none or mildly symptomatic patients, although total needs were similar to both groups. Higher unmet needs perceived by caregivers of symptomatic FES are important in the context of global shift in the responsibility of care from the hospital setting to patients' families., Families have traditionally been the mainstay of care for the mentally ill in the Asia-Pacific region, and the move toward greater deinstitutionalization has resulted in about 70% of East Asian patients with schizophrenia being cared for in the community by their families. Higher disability was correlated with higher met as well as unmet needs. The correlation for unmet needs was slightly more than met needs. Studies have found stronger correlations between unmet needs (particularly patient-rated) and quality of life (QoL) or other outcome measures than met needs., Others have reported a strong correlation of unmet needs to WHODAS 2.0 domains, while met needs were not significantly correlated with WHODAS 2.0 scores., A multisite Indian study among caregivers of persons with severe mental disorders also reported mean needs score of 7.8 with about one-third having unmet needs. Another Indian study reported positive correlations between the number of unmet and total (met and unmet) needs and certain aspects of burden among patients with schizophrenia. These findings may indicate that met needs cannot counterbalance the decrease in subjective QoL or increase in burden and disability as a result of unmet needs. In one Indian study, unmet needs were found to be significantly associated with lower education, poverty, and persistent psychopathology on multivariate analysis in patients with schizophrenia. Thus, it is important to recognize the unmet needs in patients with FES before the symptoms increase as addressing the unmet needs changes the progression of the disorder. This is more important in recognizing patients who have partially improved with medications. Given inadequate resources in terms of psychiatric services, systematic need assessment is expected to contribute to the efficient use of limited resources for the monitoring of the patients, development of appropriate interventions to cover the needs of mental health patients, and enhance their QoL. The current study had certain limitations. It was conducted on one site, among a homogenous group of patients with schizophrenia. The cross-sectional assessment also limits the generalizability of the study. The future studies require with prospective cohort design for better substantiating the findings. In patients with FES, longer illness duration and more symptomatic individuals suffer from more disability along with greater caregivers' perception of patient needs. There are more unmet patient needs; however, similar total needs in symptomatic FES patients as compared none or mildly symptomatic patients. Patients' disability, alogia, and asociality are the significant positive predictors of the unmet needs, perceived by caregivers of patients with FES. The overall QoL is improved if the need is being acknowledged as it leads to accurate and timely identification of the problem, facilitate in monitoring the course of patient's progress, and to change treatment strategy accordingly. Kessler RC, Amminger GP, Aguilar-Gaxiola S, Alonso J, Lee S, Ustün TB, et al. Age of onset of mental disorders: A review of recent literature. Curr Opin Psychiatry 2007;20:359-64. Goldstein MJ, Miklowitz DJ. The effectiveness of psychoeducational family therapy in the treatment of schizophrenic disorders. J Marital Fam Ther 1995;21:361-76. Tomotake M, Kaneda Y, Iga J, Kinouchi S, Tayoshi S, Motoki I, et al. Subjective and objective measures of quality of life have different predictors for people with schizophrenia. Psychol Rep 2006;99:477-87. Górecka JE, Czernikiewicz A. The relationship between quality of life of schizophrenic patients and clinical parameters of psychosis. Wiad Lek 2004;57:408-12. Sinha Deb K, Tuli A, Sood M, Chadda R, Verma R, Kumar S, et al. Is India ready for mental health apps (MHApps)? A quantitative-qualitative exploration of caregivers' perspective on smartphone-based solutions for managing severe mental illnesses in low resource settings. PLoS One 2018;13:e0203353. Gururaj G, Varghese M, Benegal V, Rao GN, Pathak K, Singh LK, et al. National Mental Health Survey of India, a, 2015-16: Prevalence, patterns and outcomes. Bengaluru: National Institute of Mental Health and Neuro Sciences, NIMHANS Publication No. 129; 2016. Chadda RK. Caring for the family caregivers of persons with mental illness. Indian J Psychiatry 2014;56:221-7. Awad AG, Voruganti LN. The burden of schizophrenia on caregivers: A review. Pharmacoeconomics 2008;26:149-62. Chan SW. Global perspective of burden of family caregivers for persons with schizophrenia. Arch Psychiatr Nurs 2011;25:339-49. Chong HY, Teoh SL, Wu DB, Kotirum S, Chiou CF, Chaiyakunapruk N, et al. Global economic burden of schizophrenia: A systematic review. Neuropsychiatr Dis Treat 2016;12:357-73. Jin H, Mosweu I. The societal cost of schizophrenia: A Systematic review. Pharmacoeconomics 2017;35:25-42. Testart J, Richieri R, Caqueo-Urízar A, Lancon C, Auquier P, Boyer L, et al. Quality of life and other outcome measures in caregivers of patients with schizophrenia. Expert Rev Pharmacoecon Outcomes Res 2013;13:641-9. Amaresha AC, Venkatasubramanian G, Muralidhar D. Needs of siblings of persons with psychosis: A systematic descriptive review. Clin Psychopharmacol Neurosci 2014;12:111-23. American Psychiatric Association. Diagnostic and Statistical Manual of Mental Disorders (DSM-5®). American Psychiatric Publication; 2013. Andreasen NC. Scale for the Assessment of Positive Symptoms (SAPS). Iowa City: University of Iowa; 1984. Andreasen NC. Scale for the Assessment of Negative Symptoms (SANS). Iowa City: University of Iowa; 1981. p. 789-94. Slade MI, Loftus L, Phelan M, Thornicroft G, Wykes T. The Camberwell Assessment of Need. London: Gaskell; 1999. Üstün TB, Kostanjsek N, Chatterji S, Rehm J, editors. Measuring Health and Disability: Manual for WHO Disability Assessment Schedule WHODAS 2.0. World Health Organization; 2010. Bujang MA, Sa'at N, Bakar TM. Determination of minimum sample size requirement for multiple linear regression and analysis of covariance based on experimental and non-experimental studies. Epidemiol Biostat Public Health 2017;14:e12117-1- e12117-9. Johnson S, Sathyaseelan M, Charles H, Jacob KS. Predictors of disability: A 5-year cohort study of first-episode schizophrenia. Asian J Psychiatr 2014;9:45-50. Gutiérrez-Maldonado J, Caqueo-Urízar A, Kavanagh DJ. Burden of care and general health in families of patients with schizophrenia. Soc Psychiatry Psychiatr Epidemiol 2005;40:899-904. Chakrabarti S. Family interventions in schizophrenia: Issues of relevance for Asian countries. World J Psychiatry 2011;1:4-7. Lambri M, Chakraborty A, Leavey G, King M. Quality of life and unmet need in people with psychosis in the London borough of Haringey, UK. ScientificWorldJournal 2012;2012:836067. Ernest S, Nagarajan G, Jacob KS. Assessment of need of patients with schizophrenia: A study in Vellore, India. Int J Soc Psychiatry 2013;59:752-6. Hansson L, Sandlund M, Bengtsson-Tops A, Bjarnason O, Karlsson H, Mackeprang T, et al. The relationship of needs and quality of life in persons with schizophrenia living in the community. A nordic multi-center study. Nord J Psychiatry 2003;57:5-11. Stefanatou P, Giannouli E, Konstantakopoulos G, Vitoratou S, Mavreas V. Measuring the needs of mental health patients in Greece: Reliability and validity of the Greek version of the Camberwell Assessment of Need. Int J Soc Psychiatry 2014;60:662-71. Grover S, Avasthi A, Shah S, Lakdawala B, Chakraborty K, Nebhinani N, et al. Indian psychiatric society multicentric study on assessment of health-care needs of patients with severe mental illnesses as perceived by their family caregivers and health-care providers. Indian J Psychiatry 2015;57:181-9. Grover S, Chakrabarti S, Ghormode D, Dutt A. A comparative study of caregivers' perceptions of health-care needs and burden of patients with bipolar affective disorder and schizophrenia. Nord J Psychiatry 2015;69:629-36.